A comprehensive guide to natural, do-it-yourself oral care, Holistic Dental Care introduces simple, at-home dental procedures that anyone can do. 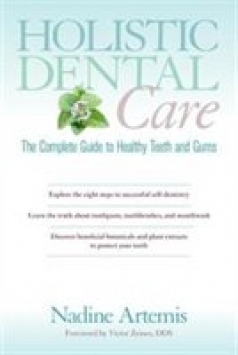 Highlighted with fifty-three full-color photos and illustrations, this book offers dental self-care strategies and practices that get to the core of the problems in our mouths–preventing issues from taking root and gently restoring dental health. Based on a whole body approach to oral care, Holistic Dental Care addresses the limits of the traditional approach that treats only the symptoms and not the source of body imbalances. Taking readers on a tour of the ecology of the mouth, dental health expert and author Nadine Artemis describes the physiology of the teeth and the sources of bacteria and decay. Revealing the truth about the artificial chemicals in many toothpastes and mouthwashes, Artemis also discusses the harmful effects of mercury fillings and the much safer ceramic filling options that are available. Covering topics that include healthy nutrition, oral care for children, and the benefits of botanical substances and plant extracts for maintaining oral health, Artemis introduces a comprehensive eight-step self-dentistry protocol that offers an effective way to prevent decay, illness, acidic saliva, plaque build-up, gum bleeding, inflammation, and more.